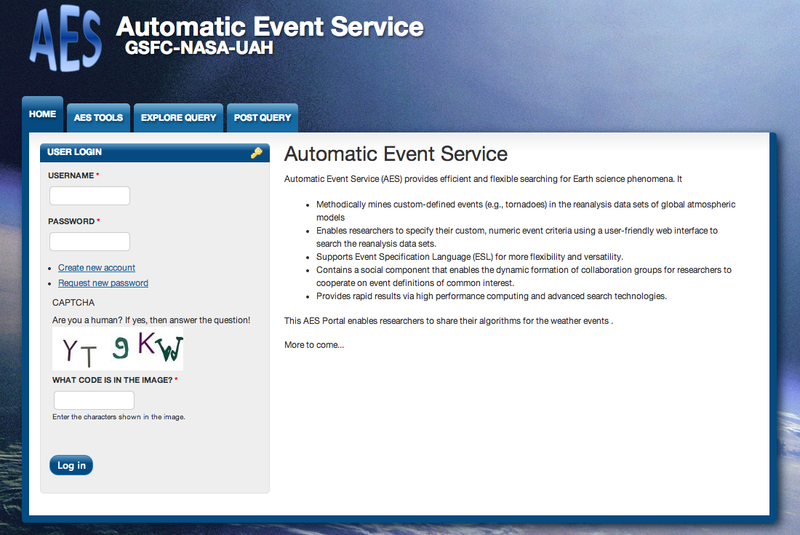 Automated Event Service (AES) is a prototype system being developed to methodically mine custom defined events in both reanalysis data sets of atmospheric general circulation models and observational data . AES will enable researchers to specify their custom, numeric event criteria using a user-friendly web interface to search the reanalysis data sets. AES includes a social component to enable dynamic formation of collaboration groups for researchers to cooperate on event definitions of common interest and for the analysis of these events. Observing and studying individual events improves understanding of a given phenomenon. This process usually begins by identifying the occurrences of these events. Once representative events are identified, researchers must locate associated observed or simulated data prior to commence analysis and concerted studies of the phenomenon. Knowledge concerning the phenomenon can accumulate only after analysis has started. Comprehensive records only exist for a very limited set of high impact phenomena; aside from these, finding events and locating associated data currently may take a prohibitive amount of time and effort on the part of an individual investigator. AES is envisioned as an environment for identifying custom­defined events but also to provide an interactive environment with quick turnaround time for revisions of query criteria and results, as well as a collaborative environment where geographically distributed experts may work together on the same phenomena. A Big Data technology is thus required for the realization of such a system. Using NASA's Modern Era Retrospective analysis for Research and Applications (MERRA) datasets the AES team developed a use case for blizzard events. Visibility reduction is directly correlated to the increase of in­air snow mass concentration, which is caused by both falling snow and blowing snow. MERRA does contain snowfall rate, which is used to derive visibility reduction due to falling snow via a relation provided in. Blowing snow can happen when there is sufficient dry and new snow accumulation on the surface with sufficiently strong wind. Thus, visibility reduction due to blowing snow is derived using MERRA data by combining snow accumulation on the surface and wind speed at 10­meter above surface. Applying blizzard definitions against subsets of MERRA data, AES was able to perform blizzard queries in < 1 second (see Figure 1). The Somali Jet was identified as a science use case to be investigated during year 2 of the project. 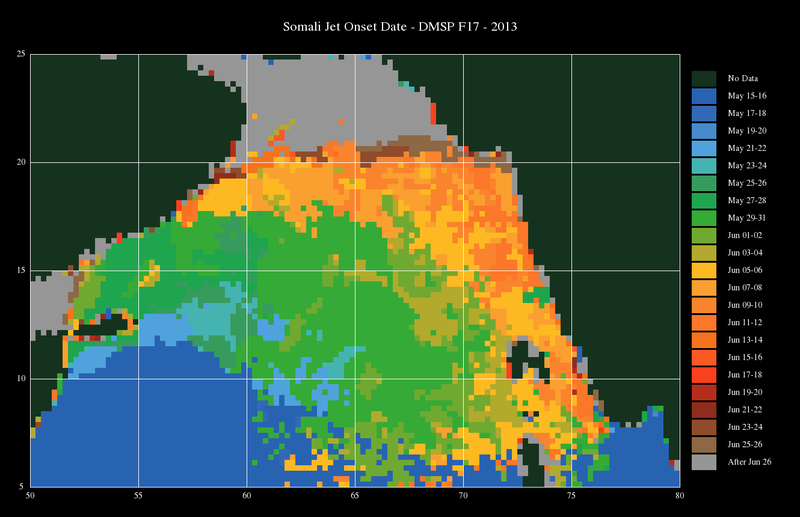 The Somali Jet is an annual phenomenon where winds off the eastern coast of Somalia intensify during the May – June time frame, and is believed to influence the Indian monsoon season. Previous work by Halpern and Woiceshyn  investigated the onset of the Somali jet during 1997. We extended this work by using the historical Special Sensor Microwave Imager (SSMI) data produced by Remote Sensing Systems (RSS). The SSMI data are available from 1987 to the present, and include wind data at a higher resolution than was available for the original research. UAH developed science processing and visualization workflows in Python using the AES Python library and a SciDB data server. The workflow produced an onset plot for each year, where each cell marks the date of the onset of the Somali Jet as defined by Halpern and Woiceshyn (6 consecutive days with surface wind speed >= 7.5 m/s). An example onset plot produced by the workflow is shown in Figure 2. Kuo, et al., “Identifying Episodes of Earth Science Phenomena Using a Big-Data Technology”, extended abstract accepted for IGARSS 2014 session on "Implications of Big Data to Remote Sensing"
 David Halpern and Peter Woiceshyn “Onset of the Somali Jet in the Arabian Sea During June 1997” Journal of Geophysical Research, vol. 104, no. C8, pp. 18041-18046, August 1999.